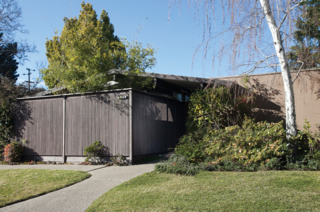 Peter and Tera Ford have always loved the original open floor plan of their Eichler, but they felt the kitchen layout needed improvement. Peter, who loves to cook and moonlights as a caterer, sought more space and better appliances. He and wife Tera wanted a friendlier breakfast and homework space for their 10- and 5-year-old kids, and more room for entertaining. 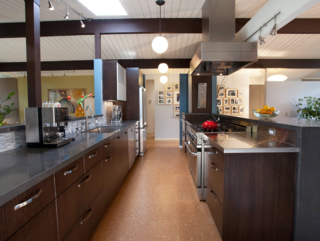 "With our Eichler floor plan, the kitchen is literally the center of the house," Peter says. "In our lives, the kitchen is the focal point for our family life, so we really wanted it to be designed around our needs." Remodeled by previous owners in the '80s, the couple's kitchen had cabinet doors that were literally falling off their hinges when the Fords arrived. "The older appliances were finicky, and not great for cooking," Peter says. The work surfaces were just barely adequate, in terms of their size and space. Finally, the bar was just long enough for one or two people, so it was never really an option for seating. 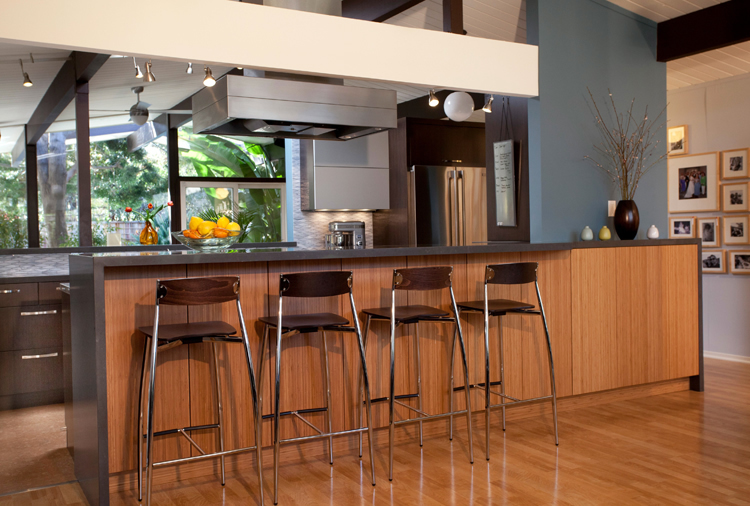 With the help of contractor Ron Key of Keycon, Inc. and designer Edward Bertlow of Artistic Kitchen Design, the Fords took the kitchen down to the frame, but left the basic floor plan. 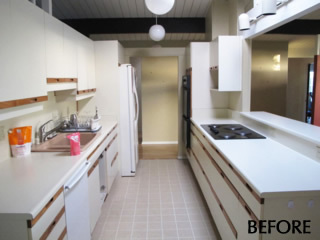 From there, they redesigned the kitchen from the ground up. Tera and Peter said they took time to imagine the ideal layout for the space. They did a lot of research on appliances and eventually selected a Capital range, Miele Speed Oven, and Elextrolux Icon refrigerator. To increase the open feeling, the Fords removed much of the upper cabinetry so that they could see through the entire kitchen and into the adjacent living and dining rooms. The decision also provided the Fords another big plus—to be able to look out the large windows at either end of the house as they worked in their kitchen. Another big change: removing the breakfast nook that a previous owner had installed, which blocked access to the outdoor patio, and replacing it with a sliding-glass door—a feature of the home's original design. "By opening up the kitchen door again, it immediately cleaned out the corner and made the flow of traffic into the backyard much easier," Peter says. A combination of wood cabinets, Caesarstone and stainless-steel countertops, LED lighting, and cork flooring completed the modern space. "The new kitchen has truly become the center of the house," Tera says. "We spend more time together in the kitchen than any other area of the house. It is incredibly satisfying to be able to stand in the kitchen and know that it turned out exactly as we wanted it to." Cabinetry: Crystal Cabinet Works, Inc.
Now that you've seen all four of our kitchen finalists, please click here now to vote for your favorite kitchen.